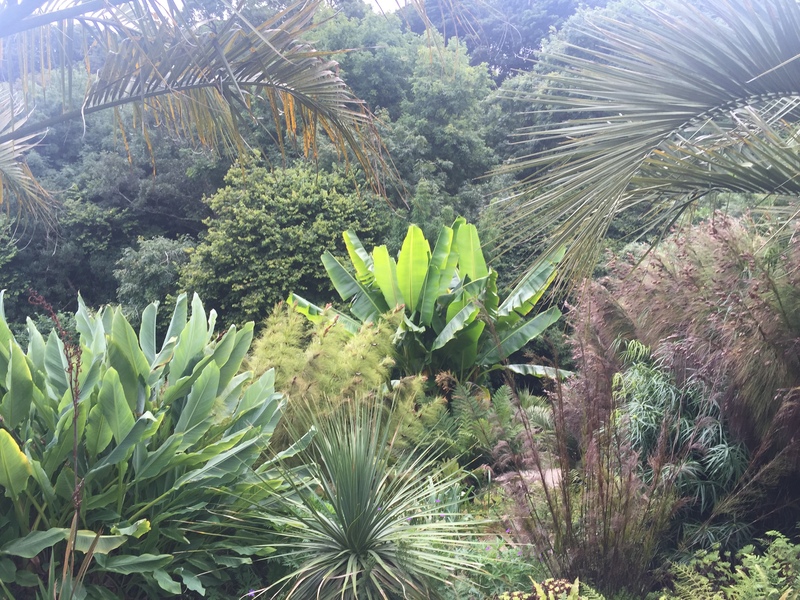 Our Cornish ramblings continue, but work resumed this week, so they’ll probably subside now. 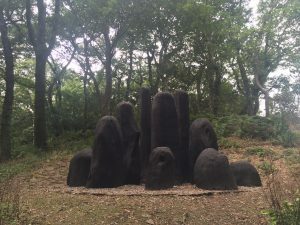 We went on Monday to Tremenheere Sculpture Gardens, near Penzance. The name derives from the Cornish tre-menhir, ‘standing (or long-)-stone farm (or place)’. 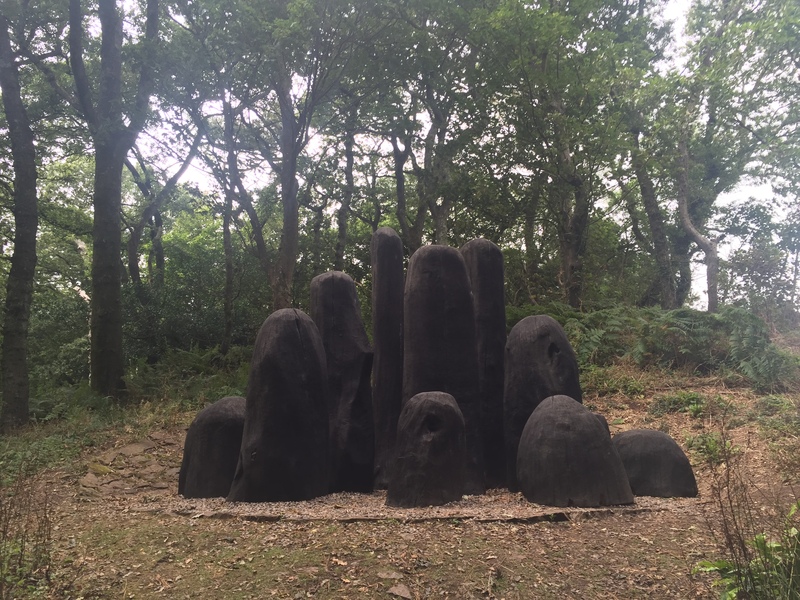 Another site near St Keverne on the Lizard peninsula on Cornwall’s south coast has an actual surviving menhir; I can find no record of such a stone at the site of the current gardens – though there are many of them across the moors of Penwith in west Cornwall. 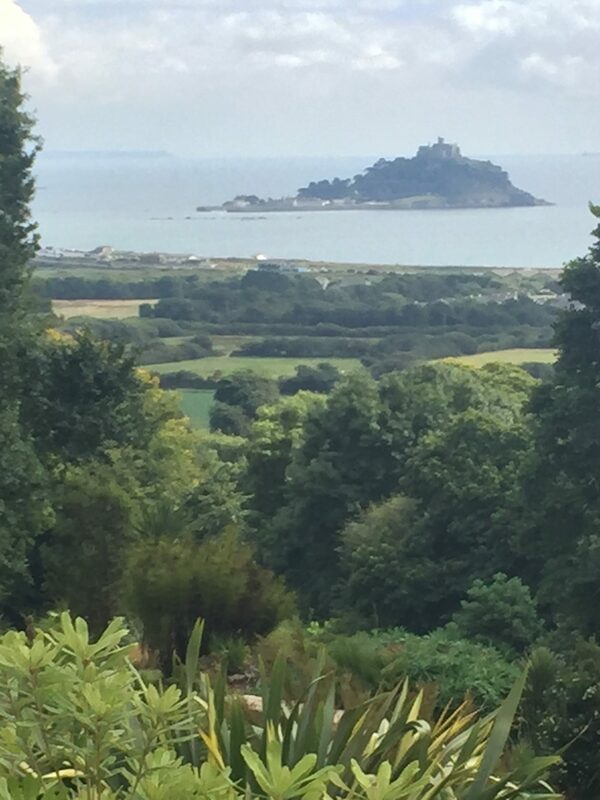 Before 1290 the lands were owned by the monks of St Michael’s Mount, in the bay below. My guess is that the Tremenheere family, who owned the estate where the gardens now stand, originated from the Lizard area and moved north, and bought the land from the monks. In the 15C it was the monastery’s vineyard. I hope my pictures convey something of this quality. 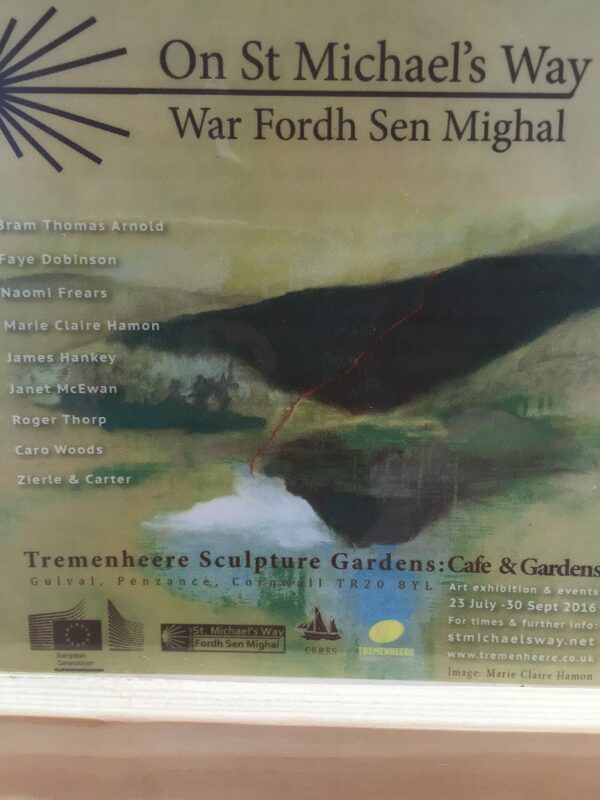 Information on the sculptures is also to be found at the garden website. 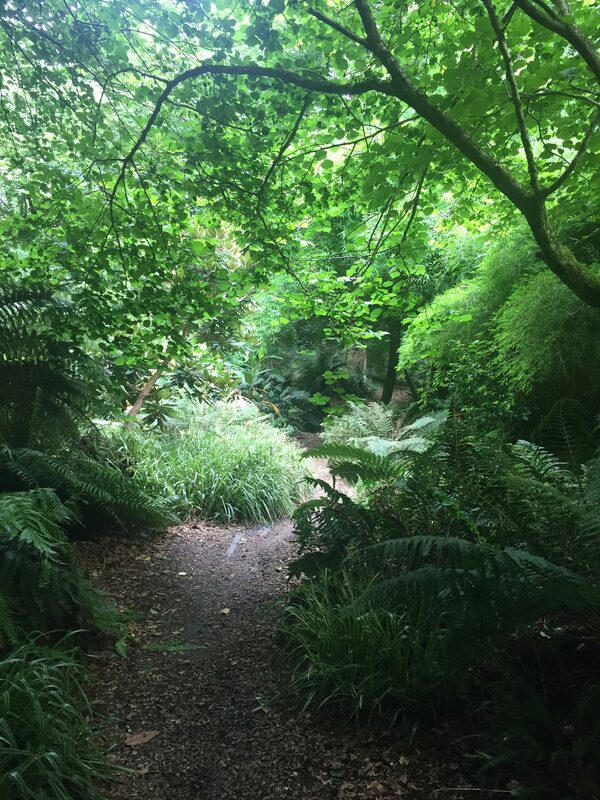 St Michael’s Way is a 12.5-mile trail starting at the church of St Uny in Lelant, nr St Ives, passing through the gardens and ending at St Michael’s Mount, Marazion, next to Penzance. Because of its historical significance as part of the network of pilgrim routes that lead to the cathedral shrine of St James at Santiago de Compostela, Spain, this is the only footpath in Britain designated part of the European Cultural Route. It’s of very ancient, pre-Christian origins, but in the 5C became the preferred route for missionaries and pilgrims arriving by boat on the N. coast of Cornwall from Ireland (I wrote about St Piran, Cornwall’s unofficial patron saint, recently HERE) or Wales and heading for the holy site of the Mount. A few decades ago the route was reinstated with the aid of Bredereth Sen Jago, the Cornish Pilgrims of St James, and other bodies. Archangel Michael is popularly known as the ‘saint of high places’, hence the dedication of Christian sites on mounts and hilltops (like Mont-Saint-Michel in Normandy). 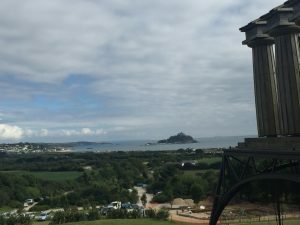 Miracles were said to have taken place at St Michael’s Mount in the middle ages, reinforcing its reputation as a spiritually significant location, standing as it does at the intersection of various ancient ley lines. According to a 5C legend St Michael appeared to fishermen (he’s their patron saint) at this Cornish site, warning them of danger. 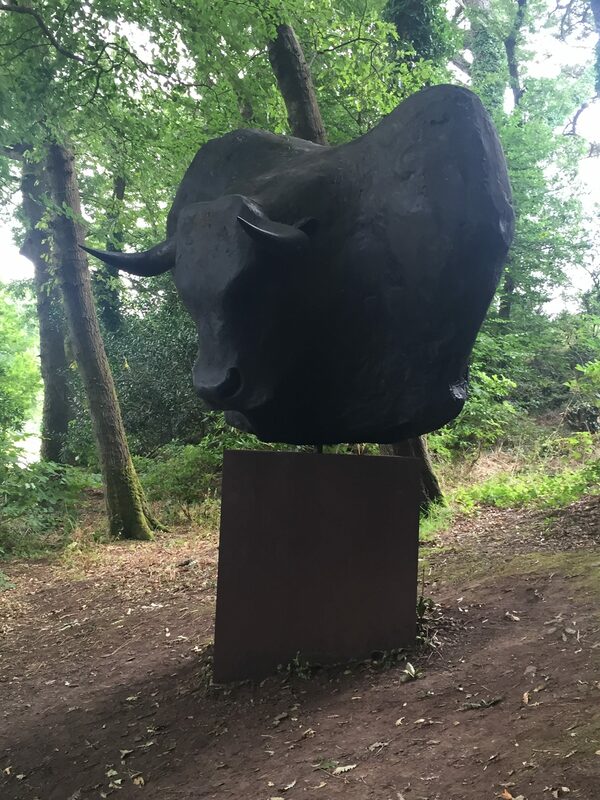 Local Celtic legends state that the mount itself was constructed by the giant Cormoran, who tyrannised and pillaged the locality, and was killed by a local Marazion lad named Jack – source of the Jack the Giant Killer fairytale. This giant’s cousin was called Trencrom. 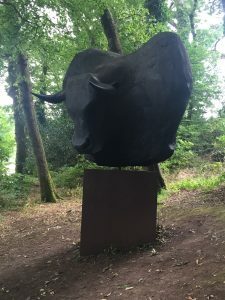 In local legends they are said to have hurled rocks at each other across huge distances, thus accounting for the many outcrops and boulders across west Cornwall. Trencrom Hill, above the Hayle estuary, is the site of a Neolithic hill fort, and has many such boulders. St Michael’s Mount (Karrek Loos yn Koos in Cornish, meaning ‘grey rock in woodland’) is connected to the mainland by a man-made causeway of granite setts, making the island accessible on foot at low tide. 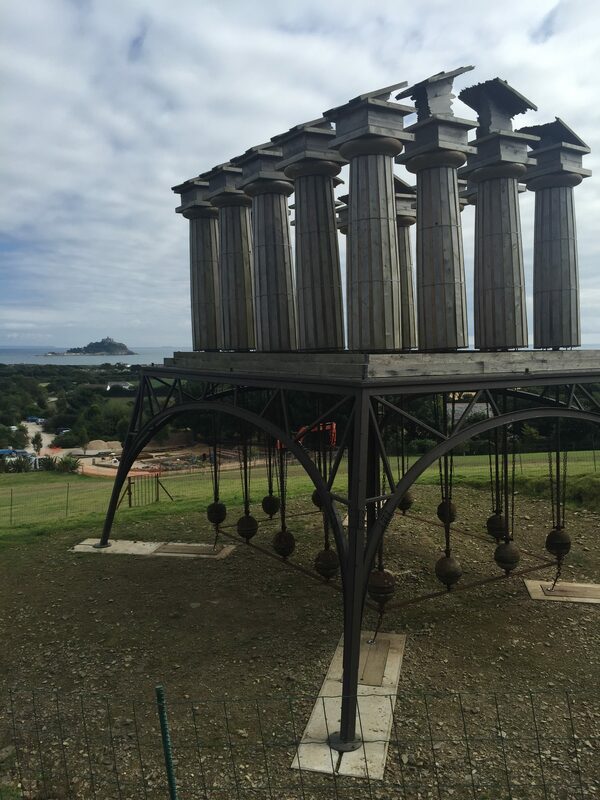 In prehistoric times it may have operated as a tin-exporting port. More useful information at its official website. It was probably the site of a monastery from the 8C, and a popular pilgrim site in the medieval period. The original 12C monastic church buildings were rebuilt in the 14C. In 1659 it came into the possession of the St Aubyn family, who still own it in joint patronage with the National Trust, through whom most of the site is open to the public. The author Edward St Aubyn is a cousin of Lord St Levan, descendant of the Mount’s St Aubyns. The chapel of St Michael is a 15C construction on the mount, while the castle houses a fascinating array of historical artefacts. 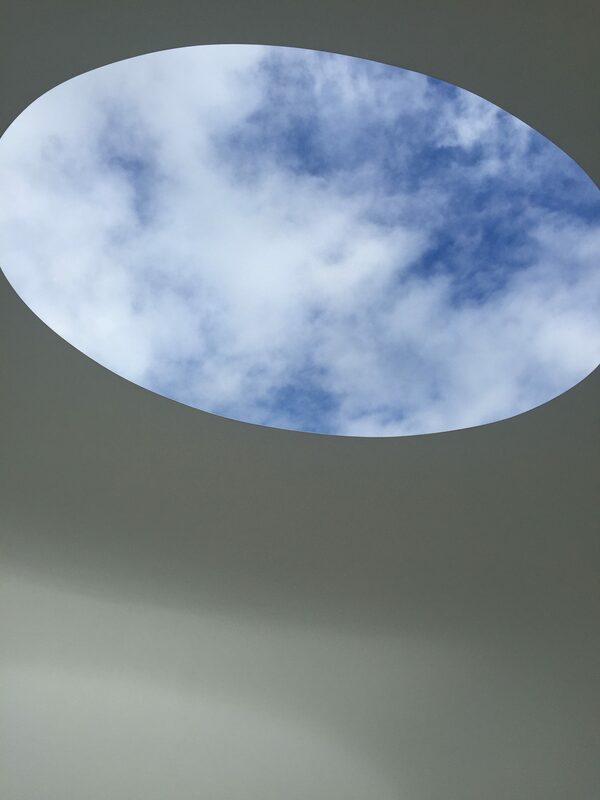 Another forthcoming event at Tremenheere Gardens, 9 September: special Skyspace evening (Tewlwolow Kernow) – James Turrell’s ‘Skyspace’ installation, with its extraordinary egg-like interior, has an elliptical space in the roof which forms a natural frame for some gorgeous skyscapes. Subtle lighting will enhance these unpredictable natural ‘pictures’ as dusk falls. PS: Local place names and church dedications reflect the activity of Irish and Welsh missionary saints in Cornwall from the 5C. 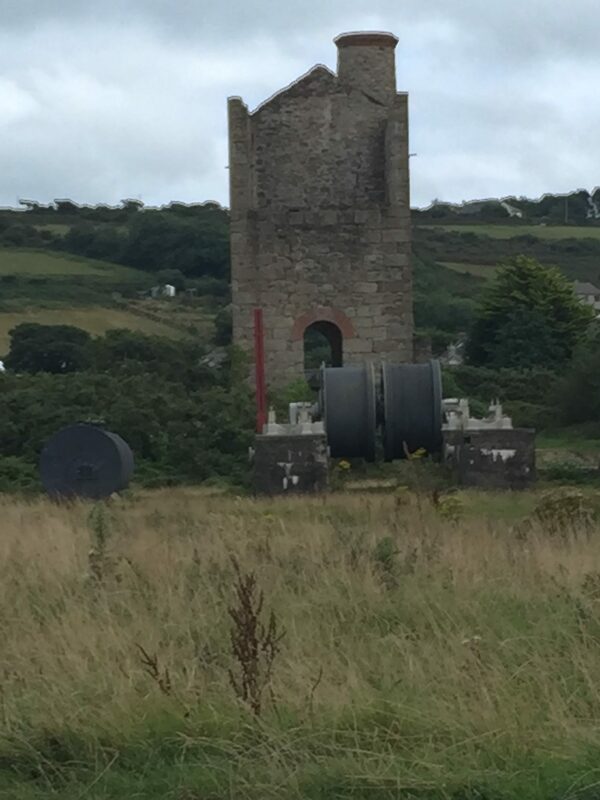 Uny (or Euny) of Lelant, and Herygh or Erc (patron of St Erth village), were Irish brothers of St Ia (Cornish for ‘St Ives’ is Porth Ia) who all landed in the Hayle estuary. I posted recently about St Piran, whose legend relates how he floated miraculously across the sea from Ireland on a millstone (intended to drown him by irate local pagan kings); Ia is said to have crossed on an equally unconventional vessel: a leaf (or, in some versions, a millstone – probably indluenced by Piran’s legend – a typical hagiographical cross-fertilization). PPS There’s a great spot at Marazion marshes, opposite the Mount, to see a huge range of birds (including the rare Cetti’s warbler), mammals and other fauna and flora: it’s a RSPB site – more HERE on their website. This entry was posted in Asides, Cornwall and tagged A Moveable Feast, Marazion, Penwith, RSPB, St Ia, St Michael's Mount, St Michael's Way, Tremenheere Sculpture Gardens by Simon Lavery. Bookmark the permalink. Gmac: kind of you to say so. I find those place names fascinating, both the Cornish ones & the ones named after saints – & there is a heap of them in Cornwall! Liz: hope you make it. We were pleased to manage the long cycle trail that I posted about last week – but you did a long walk Mousehole-Marazion. Yes, we didn’t quite mean to do that somehow!! A wander to Marazion from our holiday cottage will be a lot less traumatic, I think, this time! Another amazing post from the pen of Dr Lavery. I have loved this summer series. Thank you. Mary: I’m delighted you enjoyed them.